Earth Day is this Friday, April 22nd! Always a fun day to reflect and give back to Mother Nature, I think Earth Day is one of my favorite holidays! Having troubles figuring out what to do and where to join in the festivities? I thought I’d share some of the events that are going on in some of my subscribers neighborhoods! If your city’s events are not highlighted on this post, you can go to the Earth Network website for a more extensive list of events. I’ll start with New York and then list the other cities in alphabetical order. The be the E campaign is running events in Times Square and Grand Central April 21st-23rd. Times Square will be featuring a Green Car show, speakers and an interactive area. As Grand Central will be hosting a two-day festival of art, music and the environment. Click here to get the detailed schedule. Brooklyn’s Earth Day Celebration is held at the Erie Basin Park for the Ceremonial Launch of the Giant Floating Earth Ball. It launches 100ft into the air symbolizing your commitment to 100% percent dedication to action toward mitigating the impact on climate change and pollution. Click here for more details. A night of three violinists from different parts of the world, Tara Bangalore, Beth Bahia Cohen and Mimi Rabson. All proceeds go to the environmental organization, www.350.org. The music begins at 7:00 pm, at Emmanuel Church, 15 Newbury Street, Boston, MA. Tickets are $20; $15 students/seniors. Click here for more details. 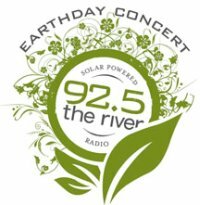 Head down to the Rose Kennedy Greenway on Friday, April 22nd for a free lunch time concert starting at 12p sponsored by the solar-powered radio station, The River. Musical guests include the Bodeans, Colin Hay and Entrain. Click here for details. This is a volunteering event where participants will perform park beautifying activities such as mulching trees, removing litter, restoring a nature trail, cleaning signs, and repairing fencing around new planting areas. Happening Saturday, April 23rd at 10a. Click here for more details. In true Hoboken fashion, they like to celebrate holidays bar style! The Village Pourhouse will be holding an Earth Day Happy Hour on Friday April 22nd from 5p-8p. 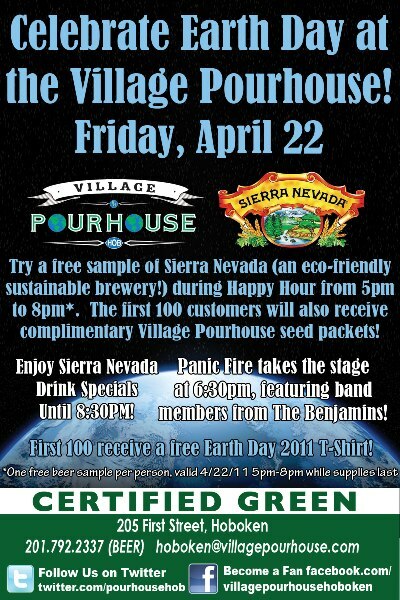 Guests will be able to sample Sierra Nevada (an eco-friendly sustainable brewery) and first 100 customers will receive Village Pourhouse seed packets! Click here for more details. This event will be held on April 23 from 10 a.m. to 6 p.m. at the Kenneth Hahn State Park in Los Angeles. Admittance to the Expo portion of the event is free, and will have healthy cooking demonstrations, youth educational activities, health screenings, eco film festival, gardening tips for urban spaces, green job symposium, green product demonstrations, and concessions. Click here for more details. A Venice Beach Fashion Show held for Conservation International on April 22, 2011 at 6:30 p.m.-9:30 p.m at the G2 Gallery. They will be selling $5 donation tickets and showing their spring/summer collection. The Dana Point Ocean Institute will be hosting a day of celebration on April 23rd from 1oa to 3p. 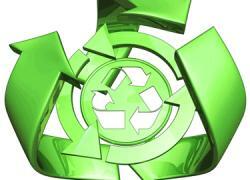 Events will include, learning how to track your carbon footprint. Discovering the benefits of using California Native Plants in your garden. Performing experiments to learn how air pollution affects our oceans. And learning about the impact of pollution along the coast and throughout the ocean. The cost to participate is $6.50 for adults, $4.50 for children ages 4-12. Participate in a beach clean-up that morning, and receive free admission for the remainder of the day. Click here for more details. Go check out Mike’s alma mater, Carnegie Mellon University, on Friday, April 22nd who will be hosting a Film Screening of Carbon Nation. The screening will be held in Doherty Hall, at 7p with refreshments at 6:30p. Watch the trailer at www.carbonnationmovie.com. Click here for further details. 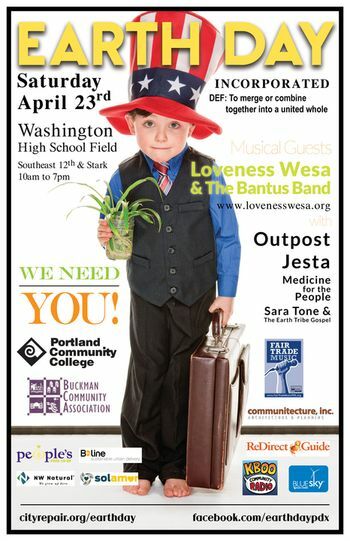 The City Repair Project and the Buckman Neighborhood Association will be hosting the We Need You! campaign at the Washington high school field. Festivities start at 10a. Click here for full schedule. Make your way down to the UC campus for the Grow your food, gardening demo and compost workshop on April 24 from 12p to 2p. Learn how to grow your own vegetables, herbs, fruit and flowers in these garden demonstrations. They will also teach composting techniques to help you reduce your landfill contribution and help your garden sustain itself. Click here for more details. 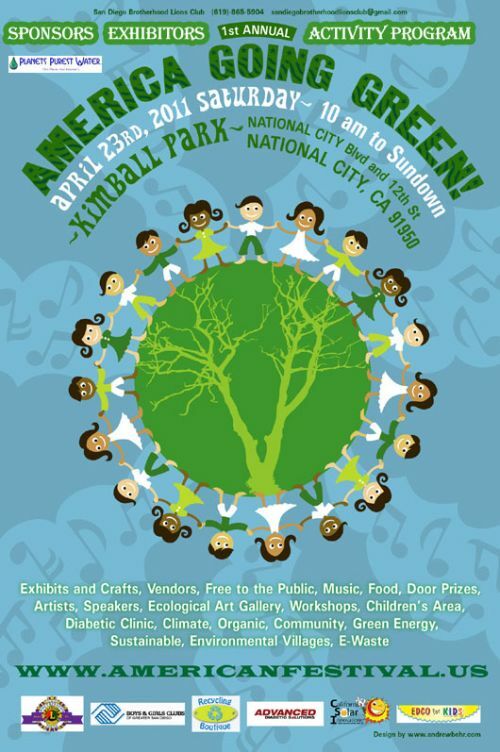 California Earth Day Jam is the region’s largest Earth Day observance and will take place in National City on Saturday, April 23rd from 12p to sundown. The festival will feature more than 8 bands and 70 environmental exhibitors. The entertainment will run on two stages all day and night at Kimball Park. Click here for more details. Head down to the Civic Center at 10a to participate in the largest Earth Day festival in the Bay Area. An educational and multi-cultural entertainment event will keynote pressing environmental issues and promote solution oriented community actions. With three stages there will be well-known speakers, activists, and musical performances. Click here for more information. The District Department of Environment is hosting GreenDC Day on Wednesday, April 20th in Freedom Plaza. GreenDC Day is an Earth Day Celebration where DDOE seeks to increase public awareness about environmental protection, energy efficiency and natural resources. This purpose of this annual event is to expose DC residents to various businesses which offer eco-friendly options for greening their lives, homes, offices, schools. Click here for more details. Hopefully this post gets you to start thinking about how you want to celebrate Earth Day! I also hope that we all take a little moment and give thanks to Mother Earth and share a way that we can make this precious planet better for today and for the future. So, what are you going to do for Earth Day? This entry was posted in Events and tagged Boston, Chicago, Earth Day, Events, free concerts, Hoboken, New York, Orange County, Portland, San Diego, San Francisco, Washington D.C.. Bookmark the permalink.